Many older properties have window frames and French doors fabricated from steel or wood, both of which are of sufficient strength to support the brickwork above them. The decision to install new double glazing, taken by most homeowners whose property does not already have it, leads to the replacement of doors and windows, almost always constructed from lightweight UPVC frames. This material, whilst being durable and attractive, does not have any structural support, which leads to brick panels over windows and patio doors developing a tendency to sag. The resulting cracks are unsightly, damaging and potentially dangerous. The solution to this problem is reinforcement rods strategically placed to form brick beam lintels. Lintel repair is achieved with top and bottom reinforcing chords, each of which comprises a pair of helical bars embedded in polymer modified grout, designed to strengthen and reinforce the masonry. The reinforced zone then acts as a virtual brick girder beam, carrying the weight of the brickwork above the openings and redis­tri­buting load paths to the section of wall at either side of it. Tried, tested and trusted, the method is a quick and cost-effective way to restore a building's structural integrity, providing a reliable stabilising effect. The method of creating beams which distribute structural loads can be complimented with vertical pinning ties to form a complete masonry arch reinforcement system. Twistfix helical bars are manufactured using high-tensile stainless steel rods which increase both the flexural and tensile strength of masonry, providing strength double the equivalent rebar, four times stronger than epoxy glass-fibre rods and an astounding seven times stronger than wound helix plate spiro bars. Both the profiled reinforcement and grout have been exhaustively tested at the Building Research Establishment and a BRE design guide and load tables are available on our website. 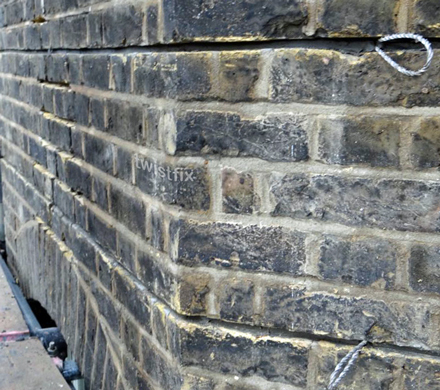 Crack stitching and masonry crack repair are just two of our many specialities at Twistfix. All of our products are manufactured to the highest standard and our expertise is readily available at every step. 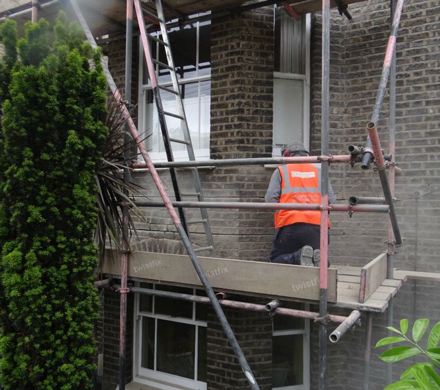 If you have a problem with cracked masonry, cavity tie failure or damp, please contact a member of our dedicated team who will be happy to assist and advice on any of our wide range of products.